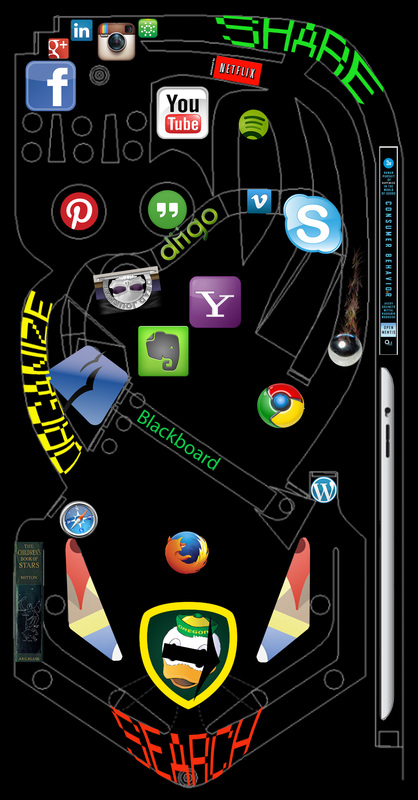 The map of my Personal Learning Environment is represented as a pinball machine. There are the obvious metaphorical reasons for this illustration such as the playful nature of a personalized approach to learning and the push vs. pull of different places and resources in my life which enable me to learn. As I was deciding on which logos to incorporate in my map, I realized there were three primary ways in which I use knowledge – search, organize and share. Firstly, when I search for information everything else seems to stop. Secondly, as I organize my thoughts and resources I try to use caution so that I will be able to easy relocate these bits of data for future reference. Thirdly, when everything is a go and I’ve made my peace it is time to share my interpretation with the world…or with anyone who will listen at least. I appreciated Steven Downes quote from his slideshare show that, “The Network is connected and interactive (not ‘integrated’) – small pieces, loosely joined” (http://www.slideshare.net/Downes/connectivism-a-theory-of-personal-learning). I feel my PLE Map demonstrates this in that it depicts the machine (a.k.a. the Network) using multiple pieces to move me (a.k.a. the pinball) around. Personal Learning Environments suggest that we are in charge of our learning to some extent; in my experience, I would argue that we are bound by walls of money, time and motivation. We choose which avenues to take within these restrictions. Sometimes we are cognizant of this process and sometimes it happens subconsciously – maybe that’s what makes it so personal. Lydeli-This makes total sense to use a pinball machine for your PLE and I think it may just suit my own search process for learning as well. Keep it in play Wizard. A big fan in Florida.